"As long as we are in the realm of fantasy weapons, we should consider Clifford the Big Red Dog. 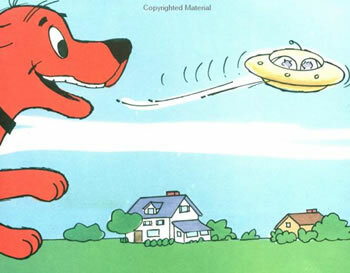 ("One day, Clifford thought he saw a giant Clifford-sized Frisbee. "interesting applications for uav frisbees, imagine some human packable disk used on over the hills missions or something like that." "Is any one delvelopeing teleportation for real?I feel that most important thing to delvelope in this century!!James,out." "In Jules Verne's "Facing the Flag", the mad scientist Roch's "Fulgurator" is a rocket-propelled disc packed with explosive material." "it looks like he's going to eat them. but cute."